weekend and hopefully some down time! couple of hours with a good book and a chocolate croissant. table drawer” to “eat something I’ve never tried before”. think my horizons are due for some broadening. had thrust into my hands many moons ago. well-intentioned resolutions and geeky younger brothers. waste by making short work of my leftovers. leftovers / fried rice incarnations here. latest local website/blog I am loving – the happy lab. With a name name like that how could I not? lovely video of my husband’s hometown…same place where he proposed to me! old-school pan de sal in too long. reach and in our control…let’s get to it! chopped dates and walnuts, orange zest, cinnamon and cumin. Add the rice. until the rice absorbs all the flavors. Take off the heat and add chopped fresh parsley. with the cheeky tag #500daysoffriedrice. you can follow me on Instagram @chichajo. to tag me – maybe I’ll do a round up of all your posts over here! What a great idea. That fried rice looks and sounds ever so scrumptious. Great recipe and beautiful presentation. Thanks for sharing! From 80 Breakfasts to 500 Days of Fried Rice… What a fun transition – and so tasty! Hi Anneli! Thanks! Using confit in soup also sounds delicious! Hi Midge! The only way I'll love numbers…through food! Hi Gio! I am certainly not perfect in the zero-waste department but I try my best! No need to stuff yourself — some leftovers are perfectly ok to freeze and be resurrected at a later date for a brand new identity! I really need to visit Zambo again soon!! Duck confit fried rice – I love it! You are so right about the fatty duck and the rice…. I do risotto with leftovers lots – this sounds equally delicious! 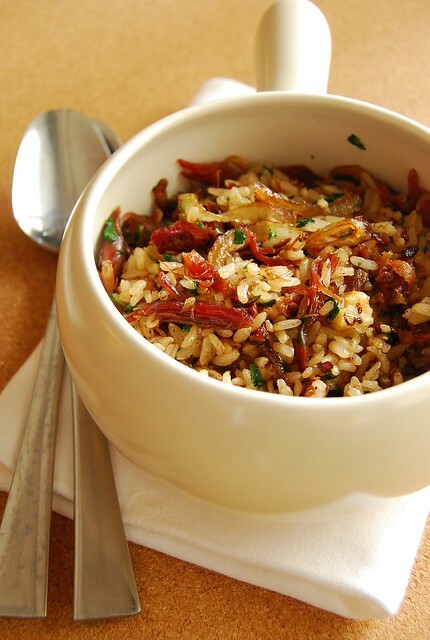 Duck confit fried rice … when can i come over! Sounds divine! I love duck confit…yum yum yum! It's unfortunate (for me) that I'm on the Paleo Diet for 30 days. No grains, no gluten, no refined sugar, no processed foods, no dairy or low dairy. But I can't say goodbye to my fave carbs forever, so I'm sure once my 30 days is done, I am going 80/20 Paleo – which is weekdays eat clean Paleo food and weekends for "treats and cheats". Hello, duck confit fried rice! Hi Katiez! Risotto with leftovers sound delicious! Hi Jen! Ok, following you now 🙂 I know I need to be on some sort of diet, or otherwise, but they just refuse to take! Haha!